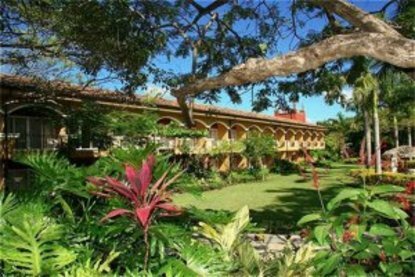 This is one of the most exclusive hotels in Costa Rica - the best location on the beach, huge trees, flowers and plenty of wildlife in our gardens. Tamarindo itself grew into a little village, with boutiques, restaurants and bars. All you need, you will find at a small distance from the hotel. El Diria is a Mobile 4 star property, the new, modern three story building offers superb views of the Pacific Ocean.Reservations require full stay credit card deposit at the time of booking and your credit card will be charged by International Vacations. We require a phone/fax or email address at time of booking to receive your voucher from International Vacations.This hotel is managed by International Vacation. Any inquiries should be directed to their customer service department at 1-888-431-2866. ***Property Notes***Cancel Policy -For bookings up to 14 days in advance of arrival - cancel 15 days prior to arrival date to avoid penalty of 100 percent of stay.For bookings made 15 to 30 days in advance of arrival - cancel 31 days prior to arrival date to avoid penalty of 50 percent of stay.For bookings more than 30 days in advance of arrival - cancellation will result in a penalty of 2 nights room change.Deposit Policy - For bookings up to 14 days in advance of arrival - a deposit of 100 percent of stay is required at booking.For bookings made 15 to 30 days in advance of arrival - a deposit of 100 percent of stay is required at booking.For bookings more than 30 days in advance of arrival - a deposit of 100 percent of stay is requried at booking.Guarantee Policy -For bookings up to 14 days in advance of arrival - guarantee to valid form of payment is required at booking.For bookings made 15 to 30 days in advance of arrival - guarantee to valid form of payment is required at booking.For bookings more than 30 days in advance of arrival - guarantee to valid form of payment is required at booking.